Protect your home from Formosan and subterranean termites in Saint Leo FL with termite inspection and removal services from Crenshaw Termite & Pest Control, Inc. 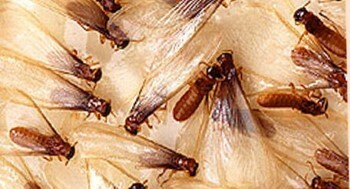 When you think you may have termites in Saint Leo FL, let us take a look at your property in Saint Leo FL immediately. We will send one our technicians to your property in Saint Leo FL to give you a free termite inspection. After the termite inspection in Saint Leo FL, we recommend the appropriate treatment for your structure. There are many things to consider when determining the right termite treatment in Saint Leo FL, including type of construction, conducive conditions, your budget, and your plans for the structure tolerance level. To remove termites from your most valuable investment, we use only the best products. We specialize in barrier and bait systems, using brands like Sentricon™ and Termidor™. The Sentricon baiting system, introduced in 1995, is the standard in termite control. This is the treatment of choice for millions of homes and thousands of prestigious properties, including The White House, the Alamo, Independence Hall, and many other icons. Rest assured, your home will be treated the exact same way.